MANASHA, Wis. -- Two parents were arrested on charges they left their 4-year-old child at home so they could allegedly terrorize a neighborhood while dressed as clowns. Police in Menasha said last Friday, several people wearing clown costumes were seen chasing cars in the early morning hours. 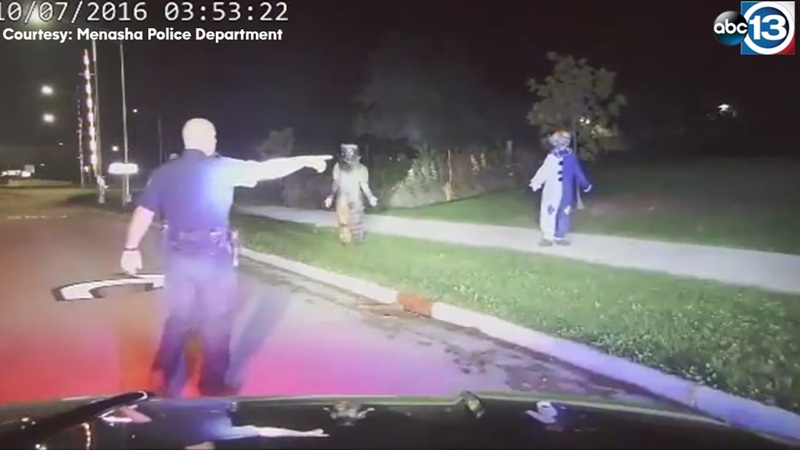 The dashboard camera of a patrol vehicle recorded video of a 29-year-old man and a 20-year-old man in clown costumes on Appleton Road. The 29-year-old man and a 26-year-old woman who drove them were arrested on child neglect charges, after police learned they left a 4-year-old child home alone for several hours, according to WBAY-TV.